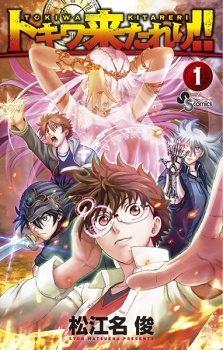 Sinopsis : Yasaka Tokiwa lives in an unusual time, and according to his dreams, it’s about to become even stranger. He’s been having a dream of a woman called Ri’in ever since the robot, who he calls Makina, came to his home. He and Makina attend the same school, where their other classmates include the secret ninja Kusanagi Kanata and the sorcerer Yata Haruka. When Tokiwa, the robot, the ninja, and the sorcerer rush to rescue the student council president from a demon, the boys find that they’ve all been having the same dream! What is going to happen to their world? January 16, 2016 in Tokiwa Kitareri! !